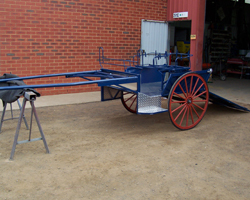 Epsom Steel manufacture horse buggies to the highest quality standards. 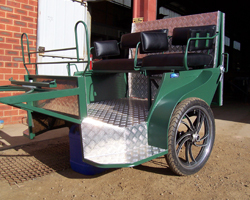 Horse and carriage driving has become a pleasurable activity and sport that is being enjoyed by more and more people who may be physically challenged. 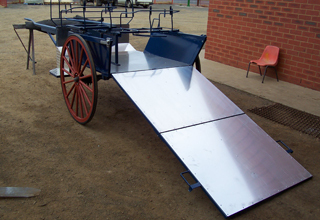 At Epsom Steel we can adapt equipment to suit your requirements. 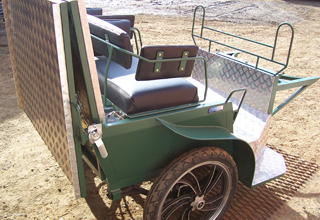 Contact us today to see how we can improve your horse and carriage experience. 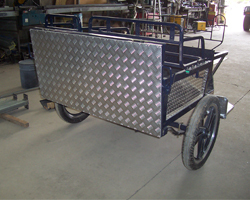 Chassis & Body Structure - Chassis and structural frame-work are usually fully welded structures manufactured from R.H.S. and S.H.S or angle iron. Most are manufactured from black steel, which without corrosive protection is at high risk of corroding (rust being the worst problem). Floors - Many horsefloat floors remain wet due to the use and conditions the float is used in, we can replace your floors for you. Axles & Springs - The U bolts are subject to rust and under body damage a broken or damaged one could cause serious damage to your float. They should be inspected regularly and replaced when and signs of corrosion are evident.Springs should be checked for sagging connection bolts and bushes for signs of wear and replaced wear necessary spring hangers checked for cracks in welds where connected to chassis. We can replace your axles & springs. Designed & Powered by Web Works.